Trelona is a compressed termite bait that has an active ingredient, novaluron, which is an insect growth inhibitor. When Trelona is eaten by the termite, novaluron harms the ability to properly synthesize and inhibits the termite to molt. When this is consumed by a termite, it will impair the ability of a termite to properly synthesize chitin and disallow the termite to molt. By being unable to molt, they are not able to form a replacement exoskeleton. Termites will either die or are incapacitated by their inability to complete the molting process. Consumption of the bait will cause the termite colony to decline, and by continued consumption, the remaining termites may result in the total elimination of the colony. Install stations within 5 ft. of points of know termite foraging, the maximum distance between each station should Not Exceed 20 ft. This product is intended for use in an ongoing program of control of subterranean termite colonies in the ground around and under any type of building or other object (structure). It does not exclude termites from a structure. Instead, it reduces or eliminates termite colonies. It affects termite colonies only if they consume it. Daily consumption of bait by all subterranean termite colonies that present an existing or potential hazard to the structure may, protect the structure against subterranean termite attack. Pre-bait monitoring is a process by which termite activity is established at a location prior to the application. Once they have consumed the pre-bait, termites can normally be induced to consume the bait. These termites then attract other colony members to the bait station where they, in turn, also consume the bait. Use WMG/BASF approved pre-bait monitors to establish activity in the station. If there is termite activity in a pre-baited station, make bait continuously available for colony consumption by placing bait in the station and replenishing consumed amounts of bait for as long as termite activity is present in the station. Bait can be placed in stations at any time prior to termite activity (Direct Baiting), with or without the presence of termites. In Florida, DO NOT use as a stand-alone preventative treatment for new construction. This product can be used for preventative treatment (before signs of infestation) of structures under construction or newly completed (as a substitute for, and in lieu of, pre-construction soil treatment). Place stations around the outside of the structure only after the final exterior grade is installed (and preferably after landscaping is completed). This can be used for remedial treatment of infested existing structures or for preventative treatment (before signs of infestation) of existing structures. Do not place product in areas where barrier type termiticides are known to have been previously applied, such as within 2 ft. of the foundation wall. Choose areas for the stations located at or near points of known or suspected termite entry into the structure. If an area of ground is not located within 10 ft. of an area of known termite entry (due to a hardened surface such as a concrete slab), you may have to create access to the ground through that surface close to the area of known activity an access. Once termite activity has occurred at a station and bait consumption has begun, depending on the rate of bait consumption in that station and nearby stations, to locate 1 or more other stations in the area (up to 5 ft.) of the infested station(s) in order that bait consumption by the colony be maximized. To install a station, form a hole in the ground approximately the same size as the station. Insert the station into the hole. Contact between the exterior of the station and the earth during installation will increase the probability of termite entrance into the station. If the station is inserted into an opening created through a hardened surface (concrete slab, asphalt, etc. ), insert station below the surface (in contact with the ground) and seal securely. Install stations within approximately 5 ft. of areas of known, probable or suspected termite foraging. Such areas may include areas with mulch or wood scraps, in contact with the ground, areas of moderate soil moisture, shaded areas, visible termite foraging tubes, etc. Install stations around a structure with the maximum distance between any 2 stations does not exceed 20 ft. If the distance between 2 points of accessible ground around the structure exceeds 30 ft., you may have to form 1 or more openings in the surface creating accessibility to facilitate baiting between those points. If the structure has an accessible crawl space, stations can be installed in the crawl space instead of installing stations around the structure. To inspect a station, remove the cover and visually examine the interior for the presence of termites, being careful to minimize disturbance of the termites, if present. If live termites are present in the station, place bait into the station. If it appears, upon reinspection, that more than half of the bait has been eaten, add more bait. If termites are not present, inspect bait or pre-bait for excessive decay or moisture saturation. Replace decayed bait or pre-bait. Replace the station cover securely. If termites have not been present in the station for approximately 60 days, any remaining bait may be removed. If bait is removed, clean out station and replace with monitor (pre-bait) or bait. Bait may remain in the station if it is in good condition and more than half remains. If termites have abandoned the station, possibly due to reduced termite activity related to low temperatures, you may have to leave the station and bait in place and recheck the station again before removing and replacing the bait. If termites have permanently abandoned the station due to excessive moisture, remove the saturated bait and re-bait the station with fresh bait after the excess moisture condition has stopped. If a station, upon repeated inspection, is found to contain excess moisture (water standing at the bottom of the station or cavity, etc. ), relocate the station, to a nearby area where the soil is better drained, modify the station location to prevent water from collecting in the station by, creating a sump area under the installed station. If termite activity is known to be present in or on the structure at the time the stations are installed, then inspect all of the stations 60 days after the date of completion. If no termite activity is present in or on the structure at the time stations are were installed, then inspect all of the stations 120 days after the date of completion. Thereafter, inspect all of the stations at 120 days after the date of the last inspection. If the feeding has stopped, or there has been no activity for one year, then check the stations every 6 months. If activity returns, place bait in the active station(s) and check every 120 days or 4 months. The success of this treatment depends upon the extent to how much of the bait is made available to the termites and how much the termites consume it. However, conditions beyond the control of the customer may prevent or delay the colony elimination. Some conditions may include other non-bait food sources, excess moisture, low or high temperatures, or the complete rejection of the bait. For use by individuals/firms licensed or registered by the state to apply termiticide products. States may have more restrictive requirements regarding qualifications of persons using this product. Consult the structural pest control regulatory agency of your state prior to use of this product. Always read and follow directions on label. Thanks for your prompt and friendly response. It's nice to deal with a company that really go out of their way to fully please their clients. Hope you're around for a long time! 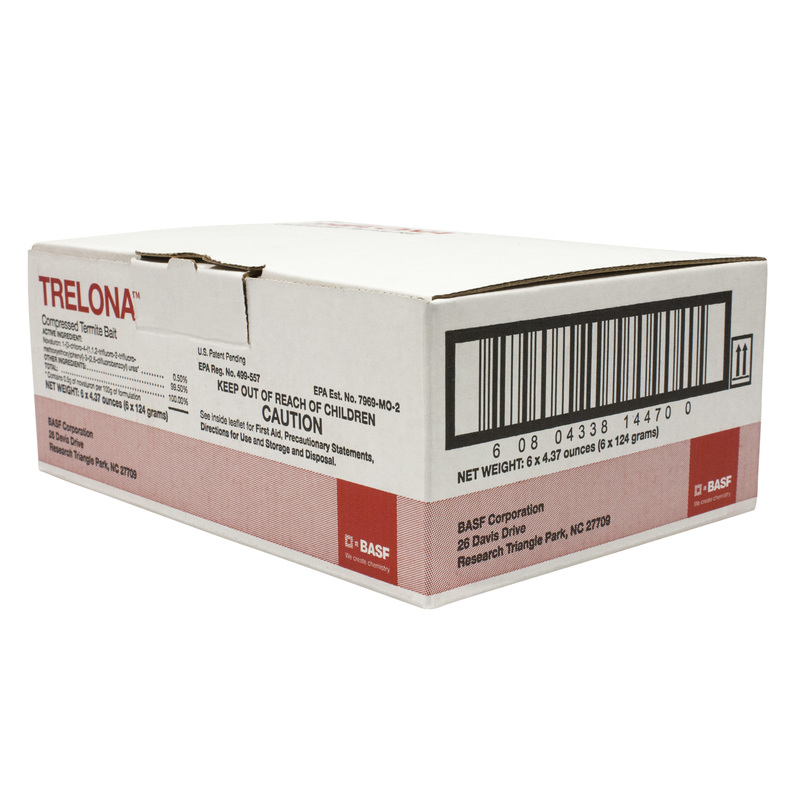 I purchase the Advance Termite Bait system about two months ago and when I checked I found light termite activity in three of the traps so I ordered the Trelona. Unfortunately the next time I looked in the traps they were full of ants who were after the termites. I ordered the ant bait and put that in and the ants are gone so now I'm waiting for the termites to return. I'm gratified that I was seeing termite activity in the traps and am hoping that it will all work out in the end. I will update in another few months. 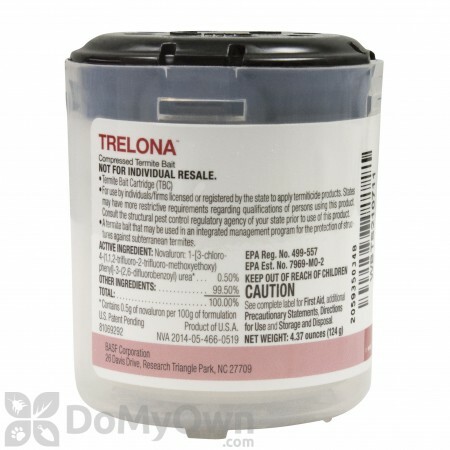 Will the Trelona Compressed Termite Bait cartridges fit into the Advance Bait Stations that I already have installed? Yes, the Trelona Compressed Termite Bait cartridges will fit inside the Advance Bait Stations. Is the Trelona Compressed Termite Bait safe to use in close proximity to fruit trees and vegetables? Trelona Compressed Termite Bait should be at least 3-6 feet away from any edibles. What is the shelf life of Trelona Compressed Termite Bait if left unopened? 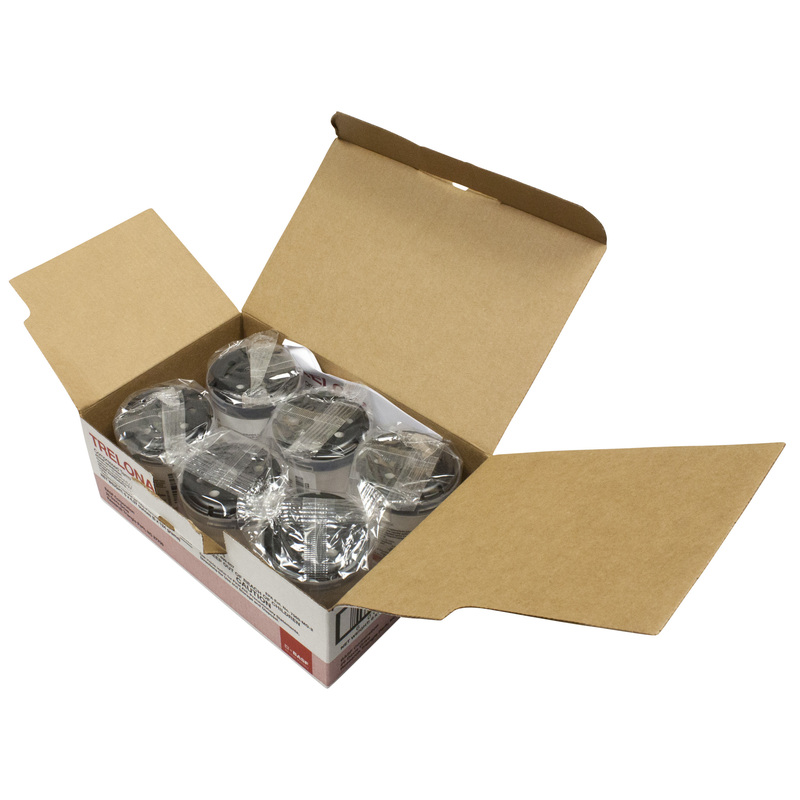 Trelona Compressed Termite Bait come individually vacuum sealed in the box of 6. Since they are each sealed, they will remain effective for up to 5 years on the shelf. Keep stored in a cool, dry place. What is the difference between the DIY and licensed pest controller version of Trelona? There is no difference between the Trelona Compressed Termite Bait we carry and any Trelona used by professionals: they are the same product. Will Trelona Compressed Termite Bait fit in a Sentricon bait station? Trelona Compressed Termite Bait will not fit in the Sentricon stations and we do not carry products that can be. These stations can only be serviced by a licensed professional who is able to get the replacement parts for them.